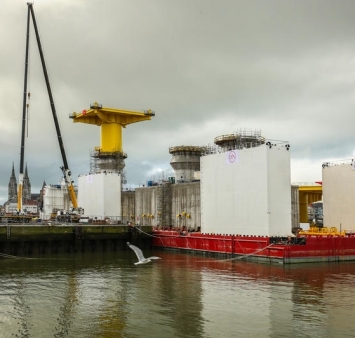 Jan De Nul Group and Smulders join forces to build two gigantic gravity based foundations for the high voltage station of the Danish offshore wind farm Kriegers Flak. The foundations have a weight of 10,000 tonnes and 8,000 tonnes and are constructed on top of a barge in the port of Ostend. The foundations consist of a concrete part (the so called Gravity Based Foundations, or GBF) and of a steel structure on top of it. Jan De Nul Group is responsible for the design and construction of the concrete GBF, while Smulders is in charge of the design and construction of the steel shafts and decks to be placed on top. The steel structures were constructed on the site of Smulders in Hoboken and were shipped to the port of Ostend last weekend. This week the steel structure will be placed on top of the concrete structure, a milestone for the project. By the end of December, the foundations will be finished and ready to be transported to Denmark. Jan De Nul Group will be in charge of the installation of the foundations, the ballasting and the placement of scour protection. The Danish wind farm Kriegers Flak, located in the Baltic Sea, will consist out of two parts. Kriegers Flak A, the west section, will have a total capacity of 200 MW. The east section, Kriegers Flak B, will have a total capacity of 400 MW. Each section will dispose of its own substation, serving both for the future Krieger Flaks offshore wind farm as well as an interconnector between the Danish and German power net. By 2022, Denmark's to date largest offshore wind farm will start generating CO2-free electricity for approx. 600,000 households. The interconnector project is funded by the European Energy Programme for Recovery.